Guitarist and composer Ryan Meagher’s fifth album is called Mist, Moss, Home. 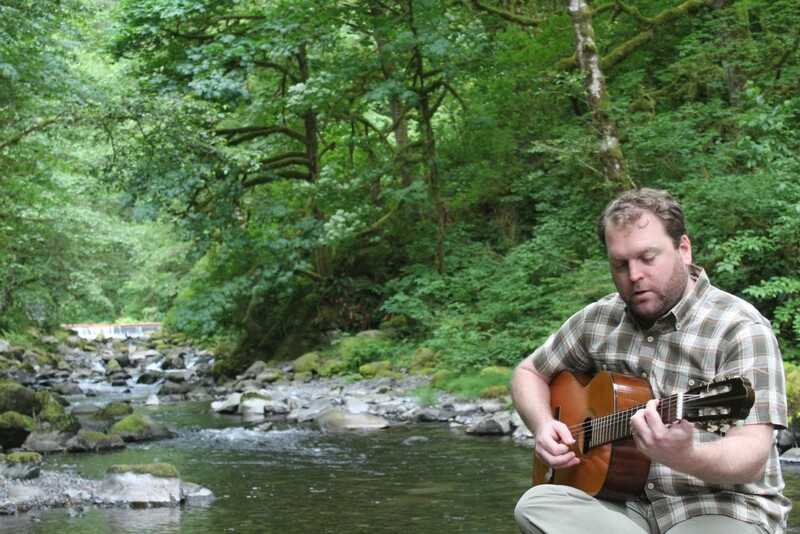 It’s a musical celebration of all things Oregon, the state he now calls home. Get the album at pjce.org. [Doug] Hey Beyond Category listeners. Before we get to the episode I just wanted to let you all know that we’ve got two great events coming up: October 19 at Jimmy Mak’s, 8 pm for Ryan Meagher’s CD Release concert featuring the music you’ll hear about in this episode. And October 29th, 7:30 pm at the Old Church with all new arrangements for our 12-piece jazz ensemble of songs by Catherine Feeny, Tahirah Memory, Annalisa Tornfelt, Johanna Warren, and Haley Henderickx. Get your tickets right now at pjce.org. Here’s the episode. [Ryan] This is so Portland. I’m on a bike, and it’s misty, and there’s moss everywhere, and people are nice! [Doug] Welcome to Beyond Category from the Portland Jazz Composers Ensemble. I’m Douglas Detrick. Guitarist and composer Ryan Meagher’s fifth album is called Mist, Moss, Home. It’s a musical celebration of all things Oregon, the state he now calls home. Here’s Ryan. [Ryan] I’m Ryan Meagher from Portland, Oregon. Mist Moss Home is really vivid imagery that encapsulates my experience becoming a Portlander. [Doug] It was years in the making, but his sense of belonging to this place took hold in a single moment. [Doug] This ah-ha moment Ryan talked about happened on a morning bike ride. [Ryan] It was a birthday present from my wife. I hadn’t owned a bike since I was you know, 12 or 13 years old. [Doug] But there he was, riding on a misty morning. [Ryan] The mist, most of the year, early in the morning, late at night, there’s a heavy, dense feeling with the moisture in the air. You can see it. And there’s moss everywhere. You can see it on rocks, on sidewalks. If you get out of the city you can see it everywhere. So the moss is just a part of the experience of being an Oregonian. [Doug] Even though he came from California, he thought of the Big Apple as his home, where he’d lived for nearly 10 years before coming to Portland., but in New York, like most New Yorkers he took the subway. [Ryan] There is a certain connection with people. You see them, and you definitely hear them, but there’s also this incredible interpersonal silence. You can be on a crowded subway train with hundreds of people but no one says a word to each other. [Doug] Going from that to the mist and moss of green Oregon had an effect on him. So, he’s adopted Oregon as his home state, but that wasn’t the only thing he adopted. [Ryan] The title, I have to confess that I stole it. I stole the title from one of my professors at the University of Nevada Reno that was going to be the title of a recording that I was going to help produce. That never came to pass, but that imagery always stuck with me. [Doug] So, this epiphany while on a misty bike ride helped him claim both the title and the state as his own. [Ryan] The moment that that title felt like it became mine I was just trekking around on my bike through the neighborhoods, and it was misty, and in the morning. And I saw the moss, and I was like “Oh, right, that’s what this is.” Mist, moss, and home. It was just kind of a surprise ah-ha moment. [Doug] And don’t worry, his teacher gave him his blessing to use that title. [Ryan] Yeah, there’s some cheekiness to it. Well, I think the fact that it’s a swing tune, that’s kind of cheeky for me. Like, I was swinging before it was cool to swing. My first couple of records there isn’t a lot of swing feel. So, it was kind of a statement, or a declaration that, yeah, I can do this too, and I’m at home with this, and I like this. [Doug] And then there’s another tune called Skip. [Ryan] A lot of the time, when I write music, I have people in mind. Skip is a tune I wrote with my Dad in mind. Skip is the name he insisted upon being called when he was the manager of my baseball teams growing up. Skip is an old baseball thing, it’s what you call the manager. Skipper or Skip. And to this day my best friends who are still hanging around San Jose call him Skip. When I was writing the tune, I was hearing the band that’s on this record playing this, Tim Wilcox, Charlie Doggett, Chris Higgins. They were in my head when this was coming out of my pen. [Doug] Get the album and learn more about Ryan and the Portland Jazz Composers Ensemble at pjce.org. This has been Beyond Category, from the Portland Jazz Composers Ensemble, the little non-profit that helps Oregon artists make a big noise. If you haven’t already, be sure to subscribe to this podcast on iTunes. And if you like this show, please leave us a review there too. It helps more listeners find the show, and that’s good for everybody. We’ll see you around!